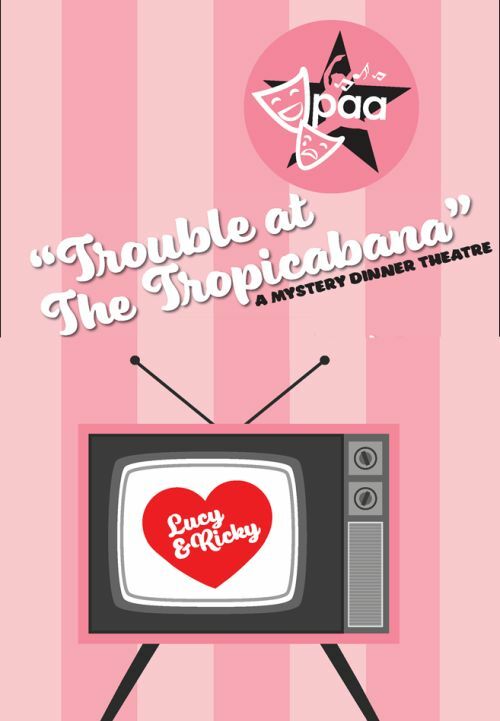 Walk down memory lane with Lucy (Melony Current, Trenton), Ricky (Bob Evick, Madison Township), Fred (Tim Braun, Monroe), and Ethel (Kelly White, Miamisburg) in this audience participation murder mystery, set in the 1950’s at the Club Tropicabana. Will Ricky become the next Clark Gable? Will Lucy and Ethel ruin Ricky’s chance with another harebrained scheme? And who committed the murder? That’s right, murder! Find out February 1 & 2, 6:30 PM at the Performing Arts Academy’s Ben Bender Theatre. Join us in one of America’s most beloved shows… and laugh, sing and dance with us. Menu for the evening: salad, ham, scalloped potatoes, peas, roll and good ole’ American apple pie. Come dressed in 50’s attire if you wish – just don’t miss out on the fun! Tickets for the entire evening are $25 (includes dinner and the show). Tickets can be purchased at www.theperformingartsacademy.com and follow the Yapsody link. The Performing Arts Academy Ben Bender Theatre is located in Middletown at 4400 Lewis Street.